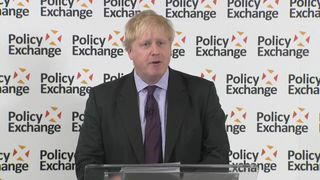 Foreign Secretary Boris Johnson has said he would like a "Brexit plane" to help him travel the world after complaining of the unavailability of the Prime Minister's "grey" RAF Voyager jet. The minister said the PM's jet, also used by senior cabinet members and the Royal Family, "never seems to be available" and said spending money on a new plane, which would promote the government's vision of a global Britain, was justified if costs were not "exorbitant".He suggested the current aircraft had an impact as a travelling symbol of the UK and was undermined by its "grey" appearance.The comments come amid Mr Johnson's five-day tour of Latin America. He has been travelling by commercial flights and taking a variety of airlines, moving between Peru, Argentina and Chile along with an entourage of officials and journalists.However, the Tory politician insisted he was not concerned about his own comfort after he had to stop off in Madrid for five hours to change planes on his Air Europa service from London to Lima.He told reporters: "We are hard as nails, we Foreign Office types. We don't care about changing planes, we pernoctate (spend the night) on planes." When asked if he wanted a "Brexit plane", the foreign secretary said: "If there's a way of doing it that is not exorbitantly expensive then yes I think we probably do need something. "The taxpayers won't want us to have some luxurious new plane, but I certainly think it's striking that we don't seem to have access to such a thing at the moment." The Queen's fleet of BAE 146 planes are available to the Foreign Office too. Mr Johnson used one of the 26-seater jets, which he described as "superb" but were coming up to 40 years old, to travel to Moscow last year.Former prime minister Tony Blair previously planned for a prime ministerial plane but the idea was scrapped by his successor Gordon Brown to save money.In 2016, the Voyager jet started transporting VIPs after former prime minister David Cameron issued a €10m refit.He was only able to make one journey on it before handing over to Theresa May. The 58-seater aircraft has since earned the nickname "Thereasy Jet".Mr Johnson said the plane's multiple users made it hard to book, saying: "What I will say about the Voyager, I think it's great, but it seems to be very difficult to get hold of. "It never seems to be available. I don't know who uses it, but it never seems to be available. "He added: "Also, why does it have to be grey?"